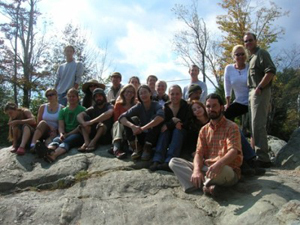 "Permaculture Design Certificate Courses - Center for BioRegional Living New York - Andrew Faust Permaculture Educator." We love to talk to prospective students about what sets our course apart and makes it so life changing. Send us an email, give us a call. We look forward to speaking with the future designers of society! This course will cover the core 72 hour Permaculture Design curriculum, including additional hours of in class and out of class activities to adapt this course to our region and to contemporary ecological issues in the United States. You will learn how to apply Permaculture principles to a diversity of settings and issues with an emphasis on urban and temperate environments. This Permaculture design course provides a positive and empowering vision for social and ecological transformation. Come be inspired by the possibilities of today and not by the fear of tomorrow! Bioregional design science that provides a new model for economic development. Addressing the major issues of our day from a whole systems perspective. Worldwide movement that is helping to regenerate local ecologies and economies. Solution oriented ecological approach to retrofitting our societies. This course is perfect for motivated individuals who wish to use the tools of Permaculture in urban and rural environments as well as for modeling sustainable and regenerative businesses. Lecture topics: Urban redesign and retrofit, passive solar and natural building, inner-city gardening techniques, indoor and apartment gardening, indoor mushroom cultivation, fermented foods, whole foods, Living Machines and natural waste water treatment, niche market and cooperatively owned business ideas, rain gardens, bioremediation, green roofs, rooftop gardens, how to clean polluted air with plants, biogas generators, Bioregionalism and regional self reliance, the economics of globalization, evolution of life on earth, history of agriculture, Biodynamics, natural history of Eastern woodlands, wood lot management, watershed health, the integration of animals into cultivated ecosystems, and so much more! 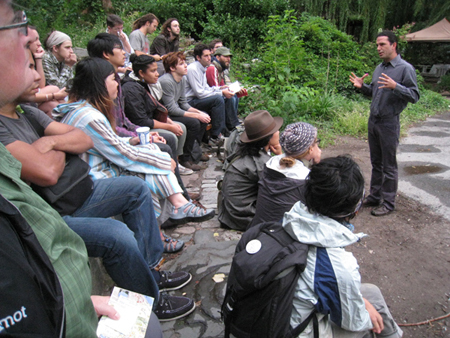 To receive a certificate students must attend all 11 classes and present a final Permaculture site design. Students will be given the option to present their final design individually which is a different approach than most PDCs. In our experience, and from what our growing number of students say, this contributes to a more practical, professional and intellectually stimulating learning experience. As a result a number of our student's final presentations have gone from paper (or electronic presentations) to actualized, real-world designs. Interpret a landscape and its ecological implications. Maps, graphical analysis, assessment, and presentations. Understanding of key design strategies for systems of varying scale. Discover and develop working relationships between elements, goals, and site realities. Design methods, techniques, observation skills, pattern recognition, and systems understanding. Permaculture principles, ethics, design techniques and strategies. Andrew Faust is one of the premier Permaculture teachers and designers in North America with nearly two decades of experience in the field. His passionate and visionary presentation and curriculum has been inspiring and motivating students since his days as an alternative school teacher at Upattinas in Glenmoore, PA. Andrew lived off the grid in West Virginia for 8 years where he designed and built a Permaculture inspired homestead including a 1600 sq ft strawbale house. He moved to Brooklyn in 2007 and has been applying his knowledge to the urban landscape culminating in a Permaculture Design Certification course many consider life changing. He is developing Centers for Bioregional Living in Ellenville, NY with his partner Adriana Magana as a pilot campus for his students, clients and baby daughter Juniper. Lisa DePiano is a certified Permaculture designer and co-founder of the Montview Neighborhood Farm, a human-powered farm and edible forest garden in the Connecticut River Valley. She has a Master's degree in Regional Planning from the University of Massachusetts and likes to ride with the worker owned Pedal People in Northampton, MA. Mark Krawczyk is a permaculture designer and educator, natural builder, traditional woodworker and ecological landscaper who resides in Burlington, VT. He has worked with leaders in these fields throughout North America and the UK and is a member of Seven Generations Natural Builders collective. 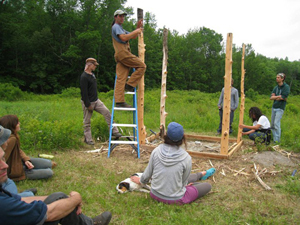 In addition he owns and operates Keyline Vermont - a sustainable farm design consulting business, a small woodworking/chair making company - Riven Wood Crafts and is the co-founder of the local permaculture and sustainability-focused community group Burlington Permaculture. Paula Hewitt Amram is the founder of Open Road Park in the Lower East Side. She will be talking to us about the transformation of a former bus depot / brownfield into the thriving community garden Open Road park is today. Lars Chellberg of CENYC and Water Resources Group Water Resources Group builds and maintains low cost Rain Water Harvesting systems across the five boroughs and leads educational workshops on sustainable water practices. 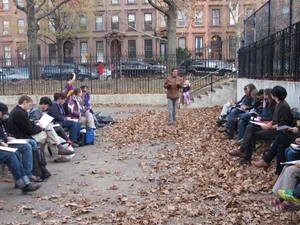 He will be leading a tour of one of the systems he designed for a community garden in the Lower East Side. Bill Young of Young Environmental LLC is a recognized leader in the environmental field with more than 25 years of experience as a project manager, designer, and wetland specialist. His expertise includes habitat restoration on disturbed lands, wetlands monitoring and construction, botanical inventory, wildlife assessment, streambank restoration; and erosion and sediment control. Keith Morris - Keith Morris is an organic farmer, builder, and environmental educator. For the past five years, he has been designing and establishing an edible forest garden and ecological homestead in Johnson, Vermont along the Lamoille River. Prospect Rock Permaculture combines reforestation, wildlife refuge, and ecological restoration with food production and community building, while educating about and experimenting with sustainable techniques and ways of building. David Harper founded Land In Common to assist community organizations, landowners, and local governments in establishing a secure land base for local production of food fuel, and fiber. Current projects include a farmland preservation plan in Boone, North Carolina, a tropical food forest network in South Florida, a report on community land trusts for the United Nations, and Cornucopia, an urban agriculture land trust in Durham, North Carolina. Land In Common builds on David’s 15-year career as a conservation professional working with land trusts and local governments to raise more than $3 million dollars in grant funds and preserve over 1,500 acres of farm and forest land. He designed and teaches a master level course in land stewardship at the University of Pennsylvania. The Land In Common vision: free the land/free the people. In order to receive a certificate students must be present for every class. However, Center for Bioregional Living's PDC's are unique in that we allow students to make up missed days and complete their certificate in one of our many upcoming courses. Want to start immersing yourself in the design solutions of permaculture but can't make all the classes? No problem. You can make up missed days and receive your certificate in a future PDC course. Andrew Faust has nearly two decades of experience designing and teaching permaculture and hundreds of inspired and empowered students. Our entire teaching team is not only experienced but also passionate about teaching Permaculture and sharing the tools for positive solutions. From these leaders in the field you will learn dynamic ways to create opportunity and abundance wherever you are. Our team of experienced teachers are available to work with you after the PDC is finished. We have continued to mentor and consult with many of our students either in person or remotely on green career changes, business models, permaculture designs, life path visioning, teacher training and more. We want to help you change the world! Our rotating campus in the city and our upstate permaculture farm will provide you with the theory and practice to get you where you want to go. Advanced training and hands-on workshops round out your knowledge gained in our PDC. Think Permaculture is all about gardening or homesteading? THINK AGAIN! Permaculture is a widely adaptable design tool that enables you to design for an entire system such as a business model, property, region, community, greenway, apartment complex and on and on. Permaculture is only limited by your experience and your imagination. We arehere to help you grow both! You will learn how to apply permaculture principles to a diversity of settings and issues with an emphasis on urban and temperate bioregions. You will graduate with a competency in full site design, master planning and a deep understanding of permaculture design. You will be poised to creatively, imaginatively and comprehensively assess and consult for properties, business models and social structures. Our Urban Permaculture focus will feature two excellent field trips: one to the extensive green roof laboratory on Randall’s Island with Dwaine Lee of the Horticultural Society and another visiting the community gardens of the Lower East Side that have been retrofitted to harvest rainwater and reclaim brownfields with Lars Chellberg and Paula Amram.